I’m a little embarrassed to admit in writing that I have vacation and birthday party envy. I attribute this envy to the sharing of photos and status updates on Pinterest and Facebook. I used to be an avid Pinner and status updater but my time has been spare lately and I want my daughters to see my eyes on them and not the smartphone screen. I’m trying to keep the envy at bay but summer is flying by and it seems like people are on an endless vacation (and I’m stuck at home). I know feeling vacation envy is pretty irrational. Those perfect Facebook pictures of the fireworks at the beach were most likely taken in between whining about the heat or bickering between siblings (or bickering between parents). Those perfectly coordinated, patriotic outfits were likely the result of a wrestling match on the beach house floor. The perfect arrangement of three generations of family likely lasted for a second. Still, I’m longing for a patriotic, fireworks, beach getaway of my own surrounded by three generations of my family clad in pastel matching duds. Even if it’s not perfect. But it’s not just vacation envy. I have birthday party envy, too, but suffer less because I’m willing to be a little more creative. I am a firm believer in making birthdays very special because it’s the one day during the year when people get to actually be the center of their own universe and celebrate themselves. I take this job very seriously when it comes to my myself and my kids (now that I have them). When my older daughter turned four this past March and requested a Snow White party, I took the Snow White theme to great heights. 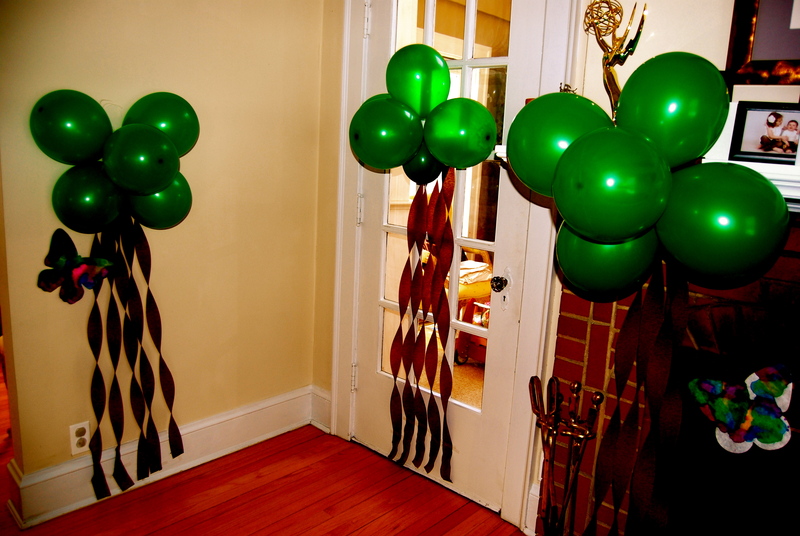 At first I resisted Pin-spiration, but succumbed and searched Pinterest, thinking, maybe someone has made balloon trees and sure enough–balloon trees were a thing! I thought I invented them! Balloon trees are a thing! I made blue birds and robins out of felt and fashioned bouquets of pipe cleaner flowers. I went to a new level of crazy over her party even though she’d never seen Snow White except for in a storybook. I’ve observed the same obsessiveness at friends’ Superhero or Princess celebrations with banners, cupcake toppers, and the like. Have we lost our minds? I’m part of this problem because I thought I didn’t have the energy to transform my yard into Sesame Street or to create a pretty princess wonderland out of tissue paper pom-pom garlands and fairy dust. I felt the Pinterest pressure, but felt no compulsion to post pictures so as not to fuel birthday envy for other folks. Ice cream cake: perfect for a summer birthday! Pinterest’s reach is so deep that my husband actually cares about this (for the record: the birthday cake has ALWAYS been his domain but he relegated it to me this year for some reason). She loved the ice cream cake. We unplugged from social media all day and enjoyed the company and the weather in real-time. Don’t get me wrong: I love Facebook and Pinterest and other forms of social media. Staying connected to local folks and friends from afar gets harder and harder and social media keeps me in touch with more people than I could have ever done without it. But beyond keeping us connected, these social media platforms also increase the flow of ideas and information at a terribly rapid pace. And they put a shiny glow on social life. So when I say, I have vacation envy, it’s because I’m seeing everyone’s 4th of July week photos, photo after photo of people at parades, people decked out in red, white and blue, people on the cape, people at barbecues and beach houses, people at the beach. And I feel like I want a vacation. 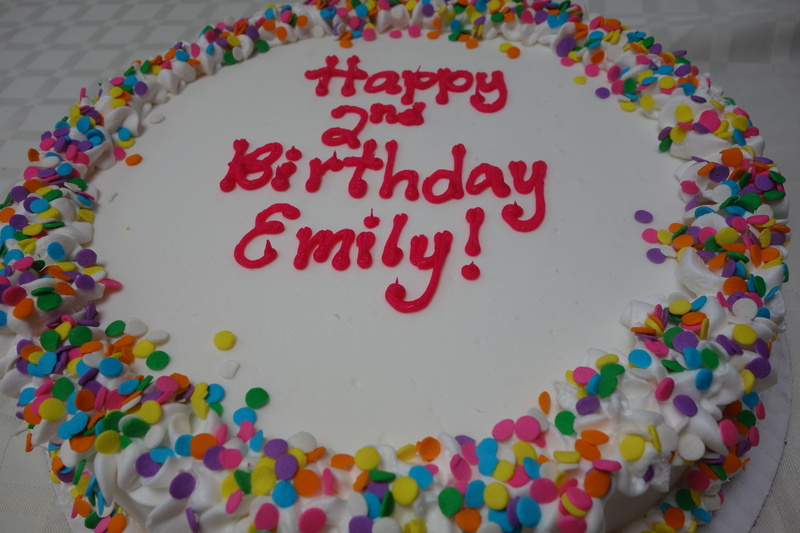 And the birthday party envy comes from picture after picture of a perfectly themed extravaganza for a two-year old. And there are so few new ideas that the same tired ideas are recycled. 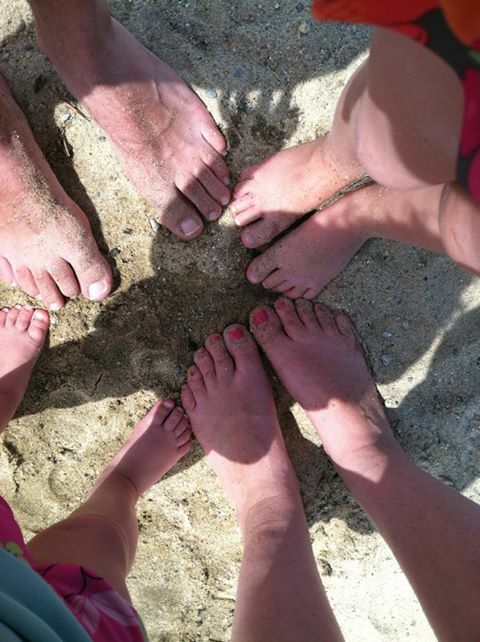 Our toes in the sand, too. Besides documentation and social media changing the way we relate and communicate, many children are already jaded (and weary) of the constant documentation of their lives. When the documentation leads to envy, though, I have to find a way to draw a line for myself. Other bloggers have written about the fatigue and disillusionment of children’s lives being so well-documented. I see it in my daily life–there are almost no pure moments unless they exist in photos…that are then posted for public consumption to Facebook. We finally made it to the beach and I felt compelled to share one picture so I could show that I, too, was having fun this summer. We’re posting pictures to keep your friends in the know about our summer exploits. We’re pinning those pictures to share good ideas. But should we? Maybe, I should just relax and enjoy those moments in real life. Without any evidence. This entry was posted in blogging, community, family, kids, lessons learned, media, parenthood, personal, social media, summer, vacation. Bookmark the permalink. Ah, yes, you took the words right out of my mouth! I have recently made a pact that I will only get on the Internet (which is literally in my hand) when everyone is asleep. It’s too tempting to get caught up otherwise. Great post!! No internet unless folks are asleep–I like this rule. I would find it tough to implement but maybe I should give it a try? Thanks for reading! It is much more doable when my toddler takes a three hour nap and my husband works sixteen hour days… When everyone is home and awake I need to be more present because it is so rare.